Surging natural gas hub prices alongside a rapidly depreciating CIF ARA market has closed a once lucrative arbitrage for US thermal coal sellers into Europe, sources said. Gas storage in the US has been 15%-30% below five-year average which, combined with the recent cold spell, led to panic in the gas market and an over-correction in prices. The January Henry Hub gas price settled at $4.451/MMBtu Wednesday, the seventh straight trading session the contract priced over $4/MMBtu. “With gas prices where they are, no wonder the guys (US traders) want to sell domestically,” a European utility trader said. According to US Energy Information data, CAPP coal’s average delivered cost was $70.56/st, or $2.87/MMBtu, in the first seven months of 2018. At an average plant efficiency of 10,045 Btu/kWh, the average dispatch price for CAPP coal was $28.82/MWh. Meanwhile, gas at $4/MMBtu and an average plant efficiency of 7,652 Btu/kWh results in a dispatch price of $30.61/MWh. “We had a position we sold back to a US producer,” another European trader said, adding that buyers in Europe have struggled to take a long position on US coal recently. Discounts to the CIF ARA price for high sulfur US coal have been uncompetitive on the back of weakening European prices. US high sulfur coal is usually blended with low sulfur Russian, South African coal at European utilities. However, the recent drop in the benchmark CIF ARA 6,000 kcal/kg NAR price has eaten into the discount. S&P Global Platts assessed the FOB New Orleans, 2.9% sulfur coal at $64.80/mt Friday, on a 6,000 kcal/kg NAR basis, factoring in a European sulfur discount. Platts Panamax dry bulk freight on the Mobile to Rotterdam route was at $18.50/mt Thursday, giving a theoretical net-forward of $83.30/mt, out of the money by $3.60. Despite stronger gas prices, ample stockpiles at plants have led buyers in the US to develop a wait and see attitude to procurement. However, with hub prices over $4/MMBtu, NAPP (North Appalachian) and CAPP are theoretically in the money for domestic coal-fired generation. Platts assessed the CIF ARA 6,000 kcal/kg NAR, 15-60 day price at $79.70/mt Thursday, a drop of $21.05/mt month on month and after having hit $103.70/mt in July, which was its highest since January 2012. Platts assessed the CSX 12,500 Btu/lb coal for December delivery at $77/st Wednesday, the highest level since November 2011. According to Platts cFlow, trade flow software, six coal-laden vessels have arrived in Rotterdam so far in November from US ports, after 12 in October. The US exported 37 million mt in the first nine months of the year, an increase of 30% from the 2017 period, according to Census data. 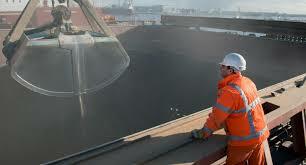 Of that volume, 3.6 million mt was exported to the Amsterdam-Rotterdam-Antwerp hub. A Post Panamax vessel was fixed Thursday via the Baltic Exchange traveling from Mobile to Hamburg with a rate of $15.50/mt.